Welcome to the Peninsula Care Services Awards page. On this page we aim to celebrate the Care industry as a whole. 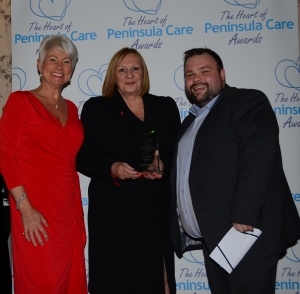 In 2014 we launched our first annual ‘Heart of Peninsula Care Awards’. It takes a special kind of person to work in the care industry, and we feel that they don’t often get the recognition they deserve for the work they do. 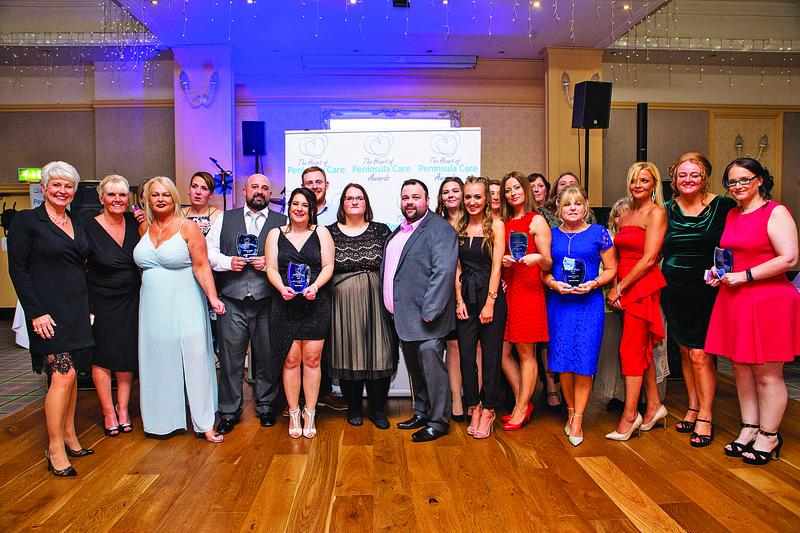 The concept of our awards evening is to offer our Care staff a chance to feel as special as they make the people in their care feel each and every day. We have a number of awards throughout the night, not only for our own staff, but we have an award for ‘Care Home Manager of the year’. 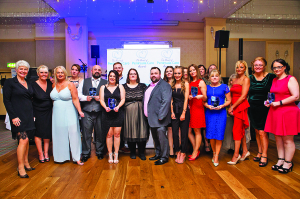 This award gives the employees of our clients a chance to nominate their manager to receive a bit of recognition for the continued hard work that goes into running and maintaining a care home. The awards cumulate in the award of the ‘Overall Heart of Peninsula’ award for the one person who has stood out the most throughout the year with their selfless deeds and constant commitment to their role within Peninsula. Doreen joined the firm back in 2015 having managed Nursing homes for the previous 12 years after deciding she wanted a new challenge. Doreen a nurse from Newtownards began her training in Ards Hospital two months after leaving secondary school back in the days where Nurses had to live within the hospital grounds. Throughout her training and working in surgical wards and theatres throughout “the troubles” she has encountered many a catastrophe. Doreen at Peninsula Care works in the role of Registered Manager where she implements day and daily the mission statement of the Company as well as ensuring her team of Nurses and Carers are trained in all mandatory areas and ensuring they deliver the best possible care to our service users thus ensuring they have a positive Peninsula Care experience. What makes her the heart of Peninsula Care though, that’s easy. The judging panel were able to see from her nomination that she displays a lot of loyalty to the organisation and “eats, breathes and sleeps” the goings on at Peninsula Care. She often wakens up or when retiring at night to bed comes up with an idea that will improve practice or an operational task within the office and is ready come 9am to inform the others in her management and office team. also those in other organisations we work with in the industry. Each finalist received a certificate acknowledging the achievement of being shortlisted to the final with those winners picking up a highly sought after Heart of Peninsula Care trophy. Following formal proceedings everyone had the chance to celebrate and enjoy the party atmosphere created by live band “Peach”. 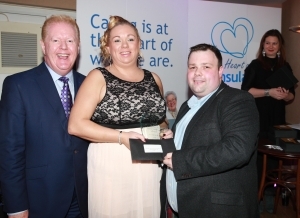 Last Friday (4th November), saw an evening of glitz and glamour at our third Heart of Peninsula Care Awards ceremony. An idea from our Director, Jonny Cook to enable those using our service to pay tribute and reward the ordinary people with an extra ordinary talent. A busy week for Jonny paid off as finalists and their guests were treated to a drinks reception, followed by a mouth watering three course meal whilst being entertained by The Irish Magician, Rod Hogg. Following our meal UTV favourite Julian Simmons took to the stage to host our Awards Ceremony. 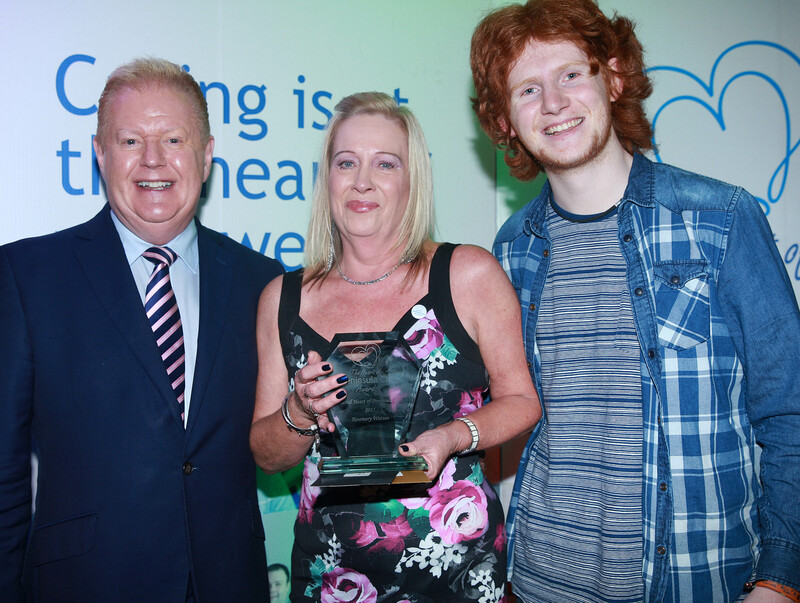 Our Heart of Peninsula Care 2016 was crowned as Community Care Worker, Lynn Groves who also picked up the award for Client Choice, presented by Belfast Giants star Mike Forney. 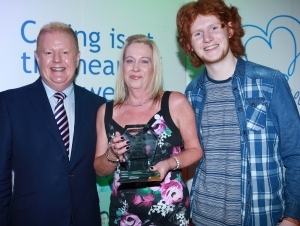 A category she had been nominated in by three of her service users all commenting how much she meant to each of them. Lynn picked up her trophy, lapel badge to display on her uniform and a £200 Thomas Cook voucher. Lynn has worked for our organisation for now two years and is a valued member of the Care at Home team. She has been known to bake biscuits for her service users and there has been word of a Christmas Trifle that does its rounds. Lynn is highly though of by our team and also those she provides care for and is a very deserving winner for this title. More on all winners to follow. 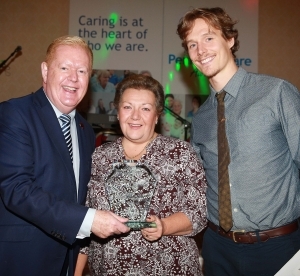 Rosemary Watson from Bangor has won the prestigious ‚Heart of Peninsula Care Award‚. 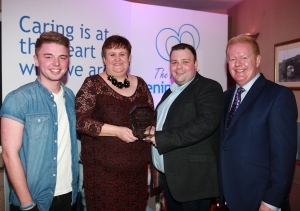 These awards, the brainchild of Jonny Cook MD of Northern Ireland‚ leading domiciliary care, nursing and recruitment agency, took place in the Tudor Tavern in Newtownards with UTV‚ Julian Simmons as compere, comedian Gene Fitzpatrick and singer Conor Scott from BBC‚ The Voice providing the entertainment. These, the second annual awards, acknowledge and reward the company‚ staff and clients. Rosemary Watson, a 54 year old office administrator with Peninsula Care Services says; “I joined Peninsula Care Services only two years ago and already feel part of their family. I was still coming to terms with winning the ‚Outstanding Achievement‚ award earlier in the evening when it was revealed that I also won the big overall award. To be honest, I’m still in shock. It is an absolute honour and all my family are so proud. I’m looking forward to booking my holiday now, with the voucher I won as part of my prize and my trophies have pride of place on my mantelpiece.” Jonny says; “Rosemary is a delight to work with and keeps everyone on their toes. She’s like my boss too, ensuring that everything is running smoothly and no job is too big or too small for her. She definitely is the deserved winner. These awards highlight how my staff’s ordinary day to day job makes an extraordinary difference to those in their care. Peninsula Care Services wouldn’t be the leading domiciliary care and nursing recruitment company in Northern Ireland and multi award winning care organisation if it wasn’t for my 180 strong staff, many of whom have worked with me since the conception of the company seven years ago. 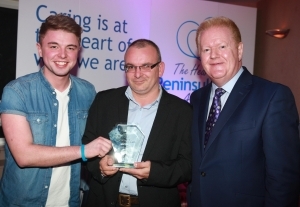 Peninsula Care are at it again, picking up another award! October 2015 seen the second year of the Ards Business Awards. Our commitment to our clients and service users have seen us pick up the Award for Excellence in Customer Service, Professional Services. At Peninsula we appreciate the hard work put in by all our staff and clients in ensuring service users get the best possible care available, and also to ensure the great reputation of Peninsula Care is spread across the country, so it is only fair that we reward our dedicated staff for their endeavours. 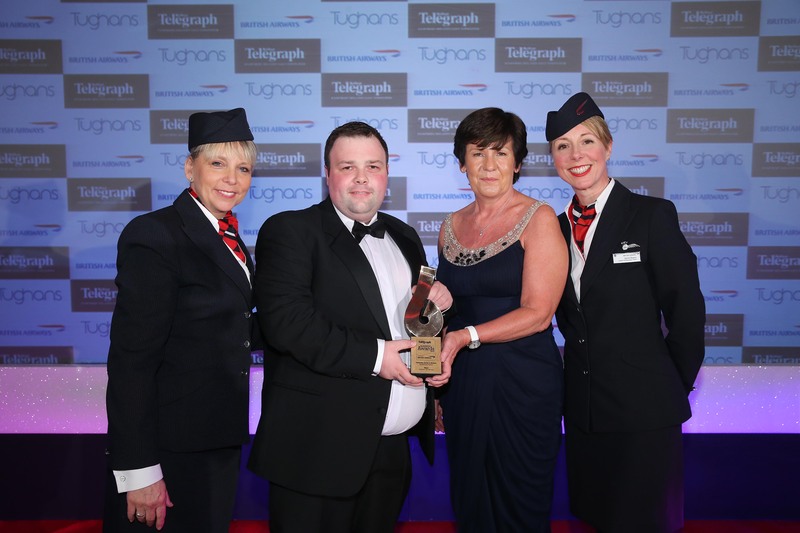 However, we also strive to compete with the best businesses in the industry, and in Northern Ireland as a whole, and recently we secured the ‘Outstanding Service to Business’ award at the 2015 Belfast Telegraph Business Awards held at the Culloden Hotel. It was such a great honour to even be short listed as finalists, and to attend the awards evening alongside multi-national businesses supplying goods and services all over the world. It is an amazing gauge of how far Peninsula Care have come over the last few years, and to show that the values we uphold every day to make us different from our competitors, are being noticed and thoroughly rewarded. Friday 23rd October seen the second year of the Ards Business Awards held at the queens Hall, which was decorated immaculately, greeted with a champagne reception, we got the chance to meet and chat to other finalists and business owners in the Ards area. We were then escorted to our tables for the awards ceremony to begin. The ceremony kicked off straight away and the winners announced of the following 8 categories as we sat in anticipation. We were then delighted and such a cheer came from not only our table though a few others from around the room when our name was called out as Joint winner for Excellence in Customer Service for Professional Services. 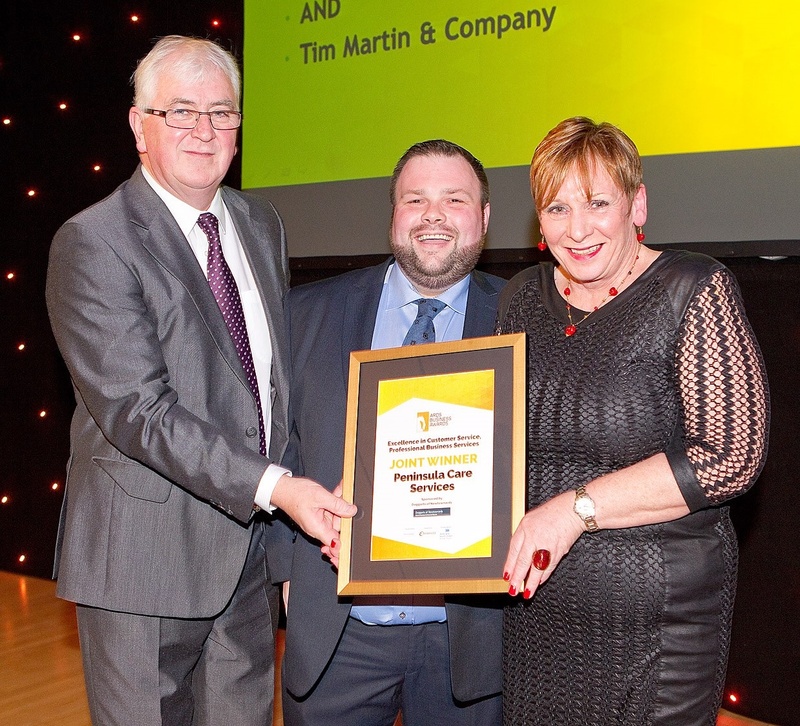 We share this title now with Tim Martin & Company, another worthy winner from the Ards area. Judges commented that this category had an extremely large number of entries which made it an even more important win for us at Peninsula Care. Following our meal and a sigh of relief and the feeling of pride and victory it was time to learn the results over the remaining categories to which we were also a finalist in another category. In the Category ‚ Best Company to work for‚ we learnt again that this was a category that had a large number of entries. We were extremely to be pleased to be sitting there as a finalist in this category. Local legal firm Worthingtons Law scooped this award which we couldn’t be more happier for them. We were extremely touched by the fact we had reached the final in this category and for all the positive testimonials we received from staff on the lead up to this awards ceremony. 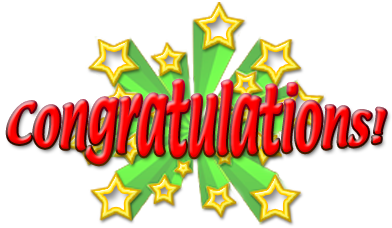 We would like to extend Congratulations to all other winners on the night and also our thanks, to all our Care and Nursing Staff at Peninsula Care, who without all your hard work and dedication, winning the award for Professional Business would not be at all possible. Jonny Cook Director commented that “without a team of passionate people sharing the same values as him and his organisation we would not have the excellence in customer service that we have come to acquire at Peninsula Care. ” Jonny went on to state, ” waking up on the morning following the awards ceremony he could not believe he was the Director of now a Multi Award Winning organisation and he is extremely proud of everyone on the Peninsula Care team on his journey”. Outstanding Service to Business Winners¬† Thursday 30th April seen the annual Belfast Telegraph Business Awards take place at the Culloden Hotel in Holywood. This year we were delighted to be short listed as finalists for the prestigious awards evening in the category of ‘Outstanding Service to Business’. As a service focused business it is an amazing feeling to get recognised for the work we, and our dedicate team of staff do every single day of the year, come rain, snow or shine. To be finalists alone was an achievement, but to hear our name announced as the winners was unbelievable. A massive thanks has to go to everyone involved with Peninsula over the last 6 years. Each person has played their part in the growth and success of Peninsula. It is the commitment and dedication of our employees that makes us stand out from other organisations. With your continued support hopefully this is the first of many awards picked up by Peninsula. Newcomer Winner -Nichola Hamilton pictured with Director Jonny Cook and UTV’s Julian Simmons. Nichola joined our team approximately 8 months before being crowned “Newcomer of the Year”. After a period of time raising her children and caring for her grandmother she realised how much she enjoyed the caring role. After deciding to bite the bullet and try caring as a career Nichola joined the team. Very keen during her induction and mandatory training Nichola had plenty to offer Peninsula Care. Nichola works within the Care at Home department as a Community Care Worker in the Bangor area. She is always keen to help us in the office when other members of the team are sick and also keeps us informed in any changes with her service users. Service users she regular visits all have positive things to say about Nichola and all enjoy her evening visits. Judges comments said that her kindness, hit with patients and work ethic shows that she works hard for Peninsula and is very conscientious. Nichola picked up a trophy, lapel badge and a voucher for The Parlour Bar and Restaurant, Newtownards. Nichola continues to work on the twilight shift and is now working on her QCF Level 2 award in Health & Social Care within our Training Academy. Madison initially joined our Recruitment Agency in January 2014 as a Health Care Assistant and completed a variety of assignments. After a while of completing temporary assignments Madison decided that she wanted something more permanent. This we were able to offer her in our Care at Home department. Madison now is able to work on a part time permanent rota in the community and is very popular with service users. Madison also works a part time block booking within a day care hospice setting. Judges were impressed with her nominations and commented that it appeared she went the extra mile which is something Peninsula Care try and do for all their clients and service users. She had a cheerful nature and has the ability to connect with her clients. Madison collected a trophy, lapel badge and retail gift voucher on the night. She continues to work full time as part of our team in both areas of the business and has commenced work on her QCF Level 3 Award in Health & Social Care within our Training Academy. 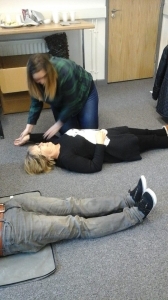 Client Choice Award Winner – Sarah Price Stephens pictured at out recent First Aid training session. Sarah joined our team back in April 2013 to gain experience whilst studying nursing at University. Sarah has a “bubbly” personality which makes her ideal when working with service users with a Learning Disability. Described by our client as “a breath of fresh air, professional and child focused” is the reason our judging panel were impressed. Sarah sadly could not be with us on the evening to collect her trophy, lapel badge and retail gift vouchers but once she knew she was a finalist she commented, ‚I am so honoured to have been nominated, never mind be a finalist. I feel very lucky to be able to work with some very special people and I truly love every minute of the time I spend with them. It is such a privilege to be able to do a job that I love. Sarah continues to complete her training to become a Learning Disability nurse which we know will be a great day for the profession. CCW Giraffe of the year Leah Campbell (left) pictured with colleague Pat Andrews. Leah joined our team back in January 2012 and at first was a shy and quiet young lady. Over this time we have seen such a growth in her confidence which we are extremely proud of. Leah has worked on both double and single runs when she first started and quickly became familiar with all of our clients. On monitoring visits to our clients they were able to tell me that Leah is well thought of and completed little tasks that were not necessarily on the care plan like making sure that the curtains in the living room were pulled. The clients all felt that she goes the extra mile for them. 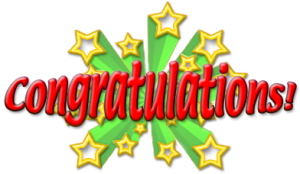 Leah is a much valued member of our team and we are extremely pleased that she is currently studying her QCF Level 2 Award in Health & Social Care within our Training Academy. 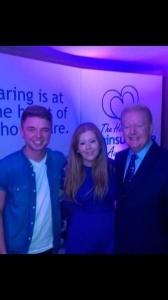 Leah collected a trophy, lapel badge and retail gift voucher on the night from Britain’s Got Talent star Jordan O’Keefe. Leah states loves working with her clients and feels that she is very well supported by the office. Unfortunately Laila was unable to attend the awards evening as she was working. It just shows she was a worthy winner. Lailia began her journey with us in January 2014. She decided that the New Year was time for a New Start. Lailia works within our Nursing Agency team and was given a Giraffe Award throughout the year from her commitment, dedication and loyalty to the organisation. Lailia could not make it on the night due to committing to a shift prior to knowing she was a finalist and did not want to let the client down. Following the awards night she collected a trophy, gift card and lapel badge from the office to which she was very honoured to be a winner. Tomasz Szczepanik, our HCA Giraffe of the year (centre). Tomasz joined our team in February 2014 and immediately became a favourite of our clients. Tomasz previously had worked for a similar organisation in England before making the move to Northern Ireland. Tomasz works for the organisation in a variety of nursing and residential homes with various client groups and also has taken on the role of Senior Health Care Assistant within some of our residential clients settings. Tomasz is extremely hard working and dedicated to his role and Peninsula Care and often goes that extra mile when covering shifts to suit the needs of the client. Tomasz is a great ambassador for Peninsula Care and is now passing on his caring influences to his son who has also joined our team working in the role of Community Care Worker.